Charcuterie is popping up everywhere, from food blogs to five-star restaurants to your local grocery store. 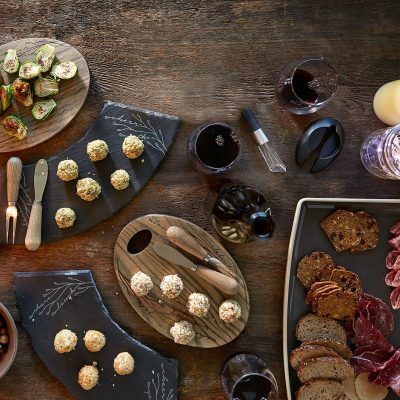 And while many people think of charcuterie boards as an appetizer option you can only get at a restaurant, it’s easier to serve at home than you might think. All you need are a few tips, the right charcuterie board, and hungry friends. Charcuterie is the French culinary tradition of preparing meats like salami and prosciutto. Originally, meat was front and center on a charcuterie board, but now you’ll see elements like cheese and antipasto mixed in. These sweet, salty, and briny extras provide a brilliant balance, and give you and your friends the chance to try unexpected combinations. Think of it as a fancy, adult version of Lunchables®, that’s way more delicious. Break out the charcuterie board when you want to impress. Although it’s traditionally served as an appetizer, it can be an equally strong stand-in for dinner parties. The variety of textures and flavors lets your guests pick and choose what they want, and the DIY elements make it fun for everyone. 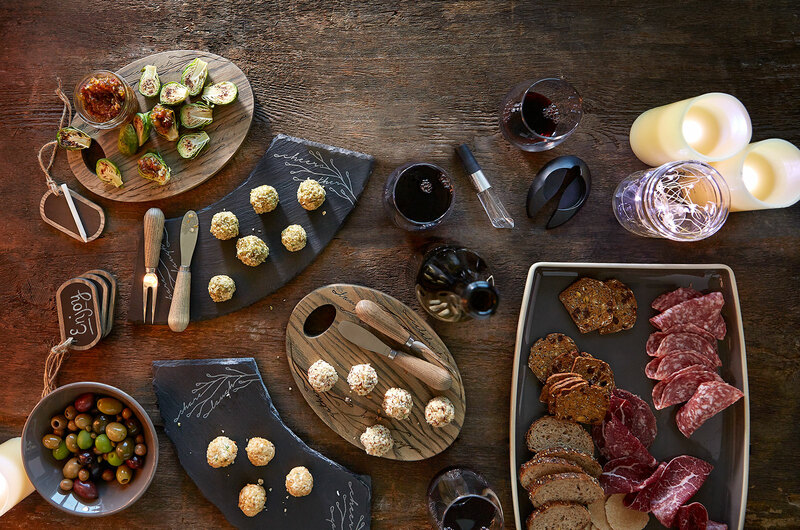 Since boards are 100 percent customizable, you can serve it any time of year, for any occasion. Charcuterie is especially great in the summer when people love to entertain but are less likely to cook. And when the holiday season rolls around, charcuterie is an elegant and easy way to feed your friends and family. Before you choose your charcuterie board, consider how many people it will serve. For a bigger party, choose a large serving platter. For a smaller crowd, use the flat side of a wooden cutting board. Cured sausage. You’ve definitely come across the beginner’s version of cured sausage on a pizza (psst…it’s pepperoni), but there are tons of other international flavors, too. Try some spicy sopressata or a dry-cured chorizo. Whole muscle cuts. These cured or smoked meats include prosciutto (dry-cured, aged pig’s leg), bresola (beef prosciutto), cappicola (dry-cured, single muscle from the top of the shoulder), and smoked ham (serrano ham or jamon Iberico). It’s important to have both rich and spicy meats on the platter. Something briny. Bright and acidic flavors like olives, cornichons, or grainy mustard pair well with the meat. Cheese pairing. Even though charcuterie revolves around cured meat, cheese is important, too. 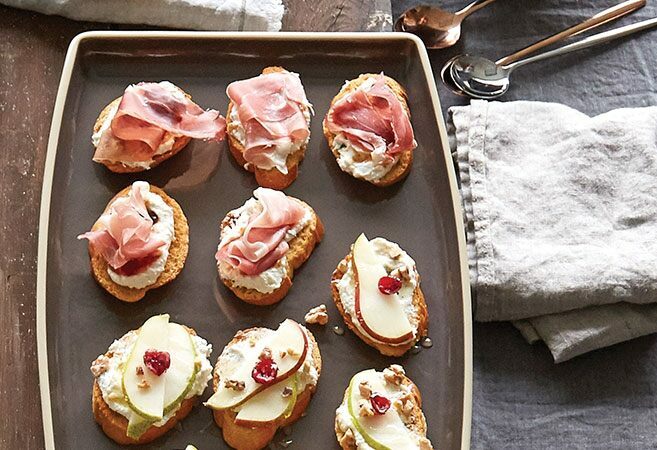 Pair regional meats and cheeses like prosciutto with Parmigiano-Reggiano. Spicier cured sausages can get a cooling balance from goat cheese. To add more texture and flavor, make sure you have a mixture of soft, hard, and strong cheeses. Something bready. Crostini, thin breadsticks, or crackers will add a little texture and crunch. Something sweet. Salty, fatty meats pair well with grapes, dried fruit, spreadable jam, or chutney. Fig jam or dried apricots are great options for a charcuterie board. Something crunchy. To add more crunch, use a variety of nuts. Mix it up with pistachios, pecans, almonds, and more. Wine or champagne is a natural fit when charcuterie is served at a party. What you pour depends on what’s on your board. Champagne is a great option to surprise your guests with because most people don’t think of pairing foods with champagne. Champagne has a distinct acidity that pairs well with salty and fatty foods like almonds; aged, hard cheeses like gouda or cheddar; and blackberries and raspberries that aren’t too sweet. Popping open some bubbly also offers a nice palate cleanser. Similarly, sparkling wines and crisp white wines go well with almost any charcuterie board. Consider prosecco, rosé, sauvignon blancs or dry Rieslings. A good rule of thumb: Choose wines with low alcohol content to keep all the flavors balanced. Have you made your own charcuterie board? What worked? What didn’t? We’d love to know! This post has been updated since it was originally published in October 2017. We just call it a meat and cheese plate. lol, I’m a simplest too! I agree with Missy, Janice and Gail. With different crackers, pepperoni, square pre cut cheeses (Crackerbarrel ), other meats, cream cheeses, etc, you can create your own plate with imagination using other condiments of pickles, olives etc. I like your ideas Libby. Thanks for sharing them with us. I know – “charcuterie” is the new “buzz word”. Plus, “meat & cheese” can imply squares of cheddar & provolone that you pick up at the deli. For about the same price, you can create your own that packs a LOT more flavor. this is not new, my friends and I have been doing this for over 40 years. Love this! Will be doing this at my Pampered Chef own house. Thanks for the post and ideas. The word “charcuterie” actually refers to the process of making the cured meats, in terms of French tradition. A “charcuterie platter” is different than a “meat and cheese platter”. Throw some cubes of Cracker Barrel cheddar on a plate with pepperoni and you have a meat and cheese platter. Charcuterie is more of an art form. The French have a tradition of selecting meats, cheeses, and other items that really complement each other in your mouth and pair well with the wine selected. It’s not new either, but has mostly been popular in Europe until hipster eateries in the United States caught on. It goes far beyond the scope of throwing random deli meat and cheese on a plate. It’s all about beautiful flavors melding together and creating food art, and it’s about trying new types of foods you’ve maybe never heard of! Thank you for explaining! My son has The Cordon Blue Ribbon and Executive Chef degree. Charcuterie is so much more than Peppered salami, carando pepperoni ,and Vermont cheddar! Linda…so good to hear from you again. The last time I spoke to you, I asked about a catalog and I’m still hoping to receive one before the holidays and would be more than happy to pay any cost for a catalog and the postage hopefully to select a few Christmas gifts as it’s getting harder for me to get out and about just to stand in long lines to pay for something I’m already tired from shopping around for! Please give me a call when you have time…702-259-7600 if you don’t mind. I haven’t replaced my computer since it died on me and at this age not sure I will. Linda…so good to hear from you again. The last time I spoke to you, I asked about a catalog and I’m still hoping ! Please give me a call when you have time…702-259-7600 if you don’t mind. I haven’t replaced my computer since it died on me and at this age not sure I will. We’re still just the same old folks, but now that the kids are grown & we’ve replaced the plastic dishes with nicer stuff, we’ve also moved from those yummy cheese & cracker plates of yore & are having fun trying to create new dishes -yes, charcuterie. Here’s a fun idea for the sweet – fresh honeycomb! Thanks for the ideas ! Simple is best and easiest. We serve charcuterie boards at my Work’s in lounge bar (I work at a hotel). I’ve even helped set them yup, but just do as I’m told. It’s neat to have an actual insight to what it is!! ? I love dries apricots and almonds on my charcuterie board. Goat cheese with jam or Pampered Chef Raspberry Habinero is fabulous. Brie with Honey or the Cranberry Salsa on PC recipes is great.